Butterfly Lizards are natives of Southern China, Indo-China and Sumatra, but they have not been much studied in their natural environment and little is known about their behaviour in the wild. Variously known as Butterfly Lizards, Butterfly Agamas, Smooth-Scaled Agamas or Butterfly Runners, the most frequently sold is Leiolepis belliana although a number of subspecies and other closely related species including L. b. rubritaeniata from Thailand and L. reevesii from parts of China and Vietnam are also sometimes seen. These lizards are striking, having a greenish-grey body with yellow/cream lines and spots, and a distinctive pattern of black and orange markings along their flanks which does make them look a little like a butterfly. The smooth-scaled alternative name comes from the animals very small body scales. 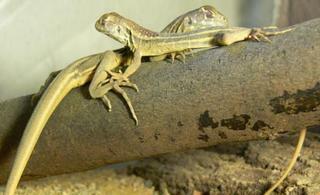 Young Butterfly Lizards are more striped, with reddish tails, the adult markings developing as they grow. Fully grown these reptiles are around 20 inches (50cm) long, the tail accounting for around two thirds of the overall length. Caring For Butterfly Lizards In the wild, these active lizards live in arid areas, often digging deep burrows, so their vivarium needs to be large and covered with a deep layer of dry flooring material on its base. The temperature should be maintained around 30 degrees C (85F) and a basking area provided where it rises to 35C (95F) or even slightly higher; at night-time, drop the temperature to around 25C (77F). Generally these animals will do well on a typical lizard diet of insects, including crickets, locusts and any amount of wild-caught garden bugs. Although these items make up the bulk of their food, Butterfly Lizards seem to be more omnivorous than most of their relatives and appreciate the occasional treat of some suitable fruit and vegetables  though how much plant material they eat seems to vary between individuals. These animals also need ready access to clean water and to keep them in good health, a UVB tube should be used for around 10-12 hours of the day.